We consciously try to avoid cereal and milk for weekend breakfast. Our choices vary depending on our mood and of course preparation time available. 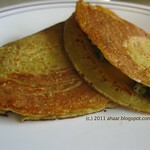 Rava idlis, masala omlette, paratha or light masala pohe,they are all favorites! Pohe is our favorite for the summer. My mom also adds potatoes in pohe, which tastes great. There are several versions from different Indian states. 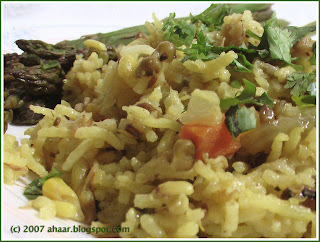 Kande (onion) pohe, is popular in Maharashtra while boiled green peas and potatoes are added in other regions. I omitted the potatoes and customized it with fresh sprouts. As you can probably see from some of my previous posts, sprouts have been a big hit in our house over the last few weeks. It's perfect for the summer. 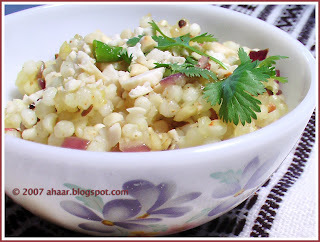 Update - Pohe is a snack made from Poha or rice pressed into flakes. 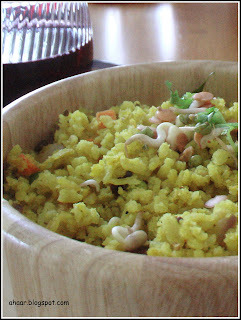 Before cooking, poha is softened with water and then cooked in to a variety of dishes. When cooked with spices and vegetable, it becomes the poha and sometimes it is also served with sugar, coconut, banana and milk. Bengalis call Pohe - Chirer Pulao (thanks Sandeepa!). For more info, click here. 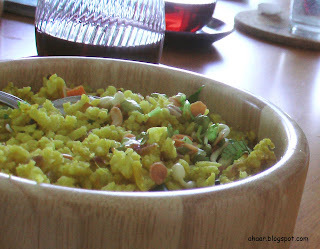 Boil water and gently wash the poha and drain the water immediately. Set it aside to soften. In the meantime, heat oil in a thick bottomed pan and temper it with mustard seeds, cumin seeds, asafoetida, green chillies, curry leaves,. Then add the peanuts and the turmeric powder and stir for 2-3 minutes. Then add the onions and cook till the onions turn translucent. Add the poha, salt, and sugar and cook on medium low heat till everything mixes well together. Cook on a closed lid for a couple of minutes. Then add the chopped cilantro leaves and the lemon juice. Take it off the heat and add the sprouts. Serve warm. We enjoyed our relaxed breakfast with some grape juice. This is going to Trupti's (The Spice who Loved Me) WBB# 12 - Spice it Up. Thanks Trupti! Beguni on a rainy day! The warm weather has given way to thunderstorms, rain and cooler weather. "This beautiful weather calls for some bajjis with chai," Aswin said and on an impulse, perhaps because the end of the week was here, we decided to make some. We quickly got our things ready for beguni and pyaji. We had just started making some when a friend called. "What are you doing?," she asked. "Making beguni," I replied. "I'll bring some dal and gin and tonic," she offered. Now who can refuse an offer like that! And in a few minutes we called another friend. "What is for dinner?" she asked. "Beguni." Immediately came the answer. "Keep making and I will be right over." Soon there was an impromptu party, the best kind if you ask me, and it all started with this beguni. If you're wondering what beguni is, it is sliced eggplants marinated in salt and turmeric which is then dipped in spicy besan (chickpea flour) mix and deep fried. Crunchy on the outside and soft on the inside, this is perfect snack to munch on or serve as a side dish with dal and rice. 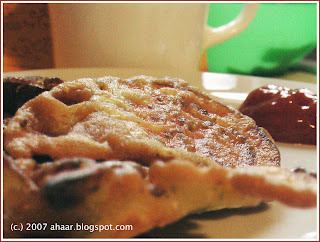 I replaced besan with rice flour mixed with some posto (poppy seeds) which made the coating lighter and crunchier. Slice the eggplants into thick slices. Marinate it with salt and turmeric and set it aside. In the meantime, mix the rice flour, posto, salt, turmeric, chilli powder with water and make it into a thick consistency. It should be thick enough to coat well and yet not lumpy or heavy. Heat Oil in a thick deep bottomed pan or a wok. 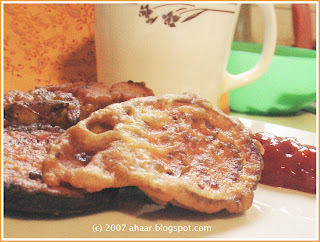 When the oil is hot, dip the eggplant in the rice flour batter so that it coats well. Fry till they are golden brown. Serve warm with ketchup. This is going to Sangeeta at Ghar ka Khana for JFI:Eggplant. Thanks Sangeeta. It has been a busy weekend. Work and no time for anything else. It's gorgeous weather too, so it is also hard to stay indoors for the rest of the time. Even my porch plants are enjoying the sun, I can spot flowers on the chilli and zucchini plant. In this hot weather, Coffee's (The Spice Cafe) theme of Something Lite seemed like a great idea to me. Not only is it easy on the waist, it's perfect for the weather too. 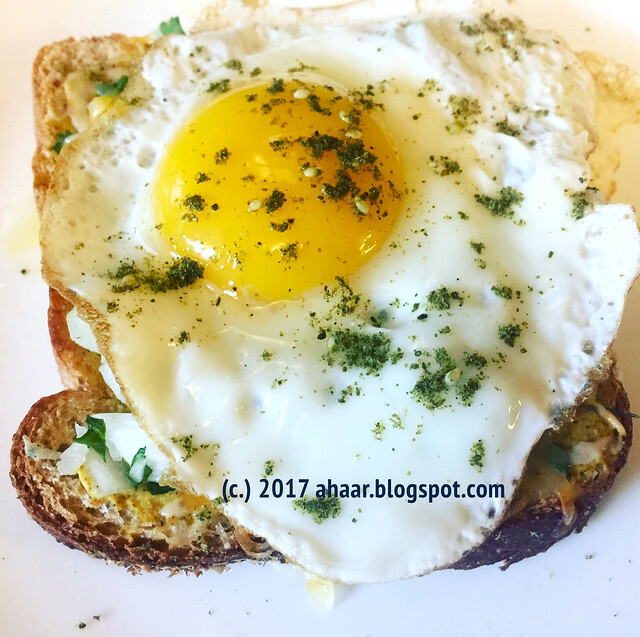 I had several ideas when I first read about this month's theme and settled on sprouted moong pulao from Mythreyee's Try this Recipe. 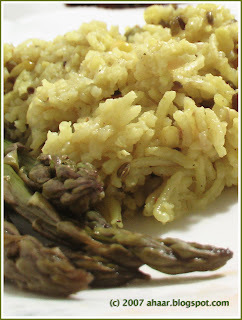 It's light and nutritious and went really well with roasted asparagus for our dinner. I omitted the garlic and replaced it with fresh chopped ginger and also added a pinch of turmeric for that golden yellow color! Temper it with cinnamon and cloves. Immediately add cumin and fennel seeds along with green chillies. Stir for a couple of minutes. Add fresh ginger and then add the onions. Cook till they turn translucent. Then add the mixed vegetables and then the sprouted moong. Stir for 3-4 minutes. Add the turmeric, garam masala. Cook till they all mix well together. Then add the basmati rice, the rest of the water, salt and let it cook on medium heat for 12-15 minutes or till the water disappears and the rice and the lentils are cooked well. Garnish with cilantro leaves and serve warm with raita, chips or roasted veggies. This is going to Coffee's MBP - Going Lite. Summer has barely started and I've forgotten what winter was like. It's nice and warm outside and instinctively our tastes have changed. 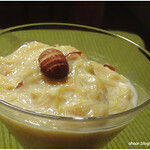 We are craving fresh fruits, salads and light food like curd rice, and sabudana khichadi. It's spicy enough for the taste buds and yet light on the stomach. Speaking of summer, after Manisha's shout out for the pickle, I put a batch of lime, chilli and ginger pickle without oil last week. It's been really sunny here, so the pickle has been cooking away. Even though it's a little early for a taste (it's not even been a week) I couldn't wait. I even gave Aswin a little taste. It was so delicious, we can't wait for it to get done! 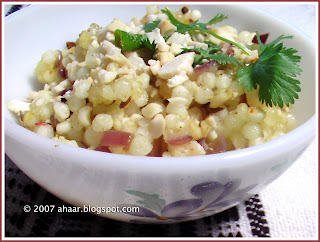 Coming back to the sabudana khichadi, it's a popular Maharashtrian fasting food made with sago pearls, potatoes, peanuts garnished with lime juice, cilantro and/or coconut. My mom made it as an evening snack when we were kids and it was popular and constantly on demand! If you're making it to break your fast, skip the onions. 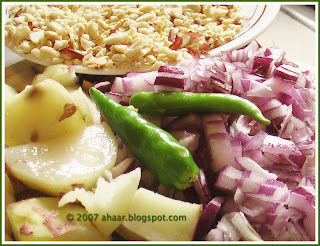 Since we were not, we added onions to the khichadi. Here is how I made it using my mother-in-law's recipe. Soak sago in luke-warm water. Drain the water and keep it aside for half an hour to one hour depending on the sago pearls. Heat oil in a wide bottomed pan and temper it with cumin seeds and green chilies. Then add the ginger, and then the onions. Saute till the onions turn translucent. Add the chopped potatoes and stir fry till the potatoes start turning tender. Add the in the sago pearls, salt and the sugar and cook it for 4-5 minutes, till it all mixes together. Add the peanuts and cook for another couple of minutes. Take it off the heat and add the lemon juice. Garnish with cilantro. 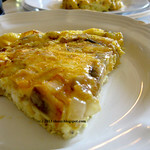 It makes a great evening tiffin or a light lunch. 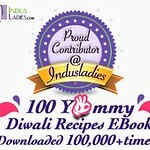 This is going to RCI for Maharastrian Food hosted by Nupur at One Hot Stove. Thanks Nupur! I first had this cookie at my friend Michelle's afternoon tea party. Celebrating a tradition we don't follow so often anymore, she had a tea party under a cherry tree in her garden. The choices were delectable - scones, cookies, salad, samosas and different kinds of tea and ofcourse interesting conversations. With late afternoon sun on our back and these delicious goodies, you can imagine how satisfying and scrumptious this tea party was! While everything was delicious, this cookie caught my attention. It is an ancient recipe cooked for royalties of the bygone era. The recipe was inspired by the Roman statesman Cato, the elder as written in the cookbook The philospher's Kitchen. The recipe is from the book Cooking for Kings:The Life of Antonin Careme, the First Celebrity Chef by Ian Kelly. Michelle used red grape juice instead of white and substituted ricotta cheese with yogurt. I liked the color and the flavor of the cookies and followed her changes. Break the bay leaves and soak them in olive oil. Set it aside. At the same time mix some sugar (I used about 2-3 tablespoons) and mix it in the yogurt. Alternatively, you can use flavored yogurt too. Mix the egg and the butter till they mix well together. Then add the rest of the sugar whisking it constantly. Add flour, salt, spices and mix it well together. Then add the grape juice till it has a soft dough texture. Make small balls from the dough and flatten them to a cookie shape. 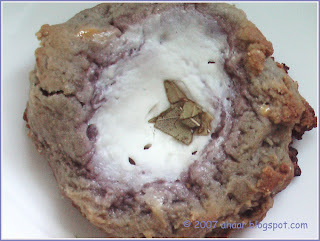 Create an indent in the middle and put a tspoon yogurt. Top it with bayleaf pieces. 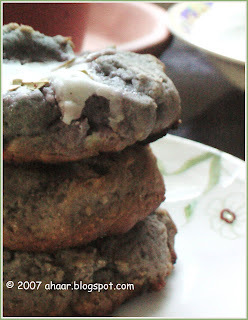 Heat the oven to 325 deg f. Set the cookies on a tray and bake them for 15-20 min depending on your oven. This is a special treat which we enjoyed on Meeta's Birthday and is going to lovely Meeta at What's for Lunch, Honey? for her Big Birthday Bang. Happy Birthday Meeta. Do you remember any recipes you cooked for the first time and it was an instant hit? 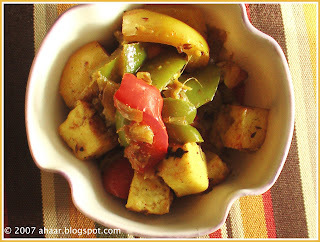 Paneer Jalfrezi is one such recipe for me. I made it for the first time a couple of years ago and must say that I haven't altered the recipe much since then. Jalfrezi refers to a dish cooked with peppers and onions. The flavors and color of peppers, onions and the softness of the paneer (cottage cheese) mix with the heady aroma of garam masala to give this unique moghlai flavor. It's often served with rice, roti, or parathas but my personal favorite is naan. 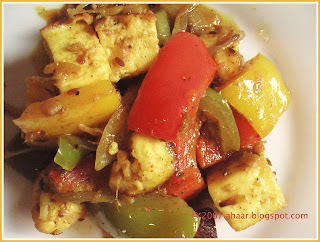 Heat oil in a pan and saute the paneer till they start turning golden. Set it aside. Heat the rest of the oil and temper it with cumin seeds and red chilli. Add the ginger paste and saute for a couple of minutes. Then add the onion and cook till they start turning translucent. Add the chopped pepper and saute for 3-4 minutes. Then add the turmeric powder, chilli powder, and coriander powder and 1/2 cup water and let it cook on closed lid for 7-8 minutes on medium heat till the peppers are about half done. Add the paneer cubes, salt and garam masala and let it cook for another 4-5 minutes till it all mixes well together and it has a dry consistency.